Welcome to Miller's Cottage, brought to you exclusively by Character Cottages, local specialists in stylish Cotswold holiday rentals. 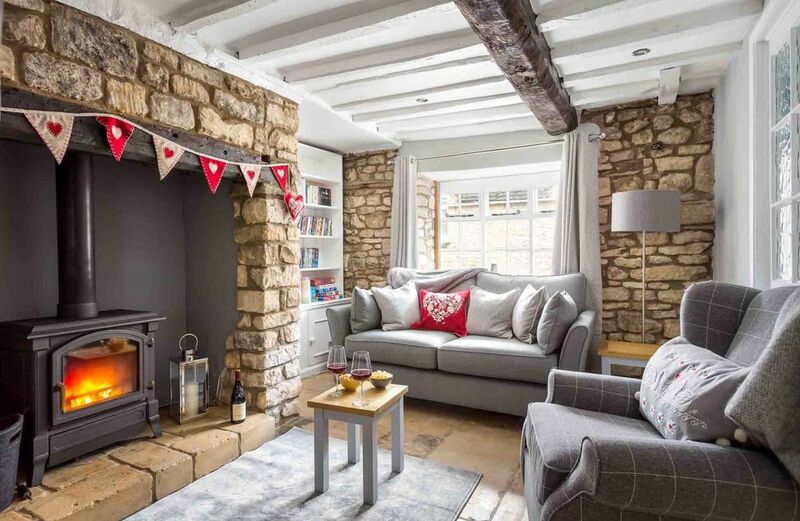 Miller's Cottage is one of a row of traditional Cotswold stone cottages in the heart of Winchcombe, an ancient Saxon town situated on the famous Cotswold Way. Boasting a thriving local community, the town offers excellent amenities, with independent shops, several pubs and even a Michelin starred restaurant. With an abundance of local walking and cycling trails, plus places of historical interest, including Sudeley Castle, Winchcombe has plenty to keep visitors occupied. The town is also within easy reach of the many charming market towns and villages of the Cotswolds, guests can ride the Gloucestershire Warwickshire Steam Railway directly to Cheltenham, and the beautiful cities of Bath and Oxford are easily accessible for day trips. The cottage has a wealth of character features, including exposed Cotswold stone walls, flagstone floors, original oak beams and two wood burning stoves in beautiful fireplaces. To complement and enhance the character features, the owners have lovingly renovated the cottage, giving it a sumptuous, contemporary feel throughout. Modern facilities include wireless internet access, a Freeview TV with DVD player and a well presented kitchen. Miller's Cottage sleeps a maximum of four people in two bedrooms, with a lovely family bathroom, and there is a beautiful back garden with stunning views of the surrounding hills. The cottage has an allocated parking space close by and further on street parking is available in the town. Miller's Cottage is perfect for a small family or a group of friends seeking a cottage filled with character and style, in a beautiful Cotswolds market town. Electricity and gas are included in the rental price. An initial basket of logs is provided for the wood burning stoves and further log supplies can be purchased locally. The property has free wireless internet access, a Freeview TV with DVD player, and a DAB radio with Bluetooth speaker and an iPod docking station. Guests can pull up close to the property to unload their luggage. The property has an allocated parking space approximately 50 metres away and there is further on street parking available in the town. There is a long stay car park a short walk away from the property, if additional parking is required. The property's garden is enclosed, however young children should be supervised outside at all times due to the steep steps to the rear of the garden. A small quantity of initial consumables is provided for your convenience (eg. tea, coffee, Nespresso coffee pods, sugar, dishwasher tablets, washing up liquid, soap, washing powder, toilet rolls, etc), however, you should not expect the quantity of these provisions to be sufficient for the duration of your stay. There are steep steps to the rear of the garden. If you would like to read more about the property’s features, then feel free to get in touch by searching the web for Miller's Cottage Character Cottages! Wife not happy with hard mattress in twin bedroom. I liked it. Door swing in master bedroom impossible. How do you get out of bed in the middle of the night to pee? Furniture very comfortable. High end cottage. Thank you for your comments, we hope you had a good stay. We're sorry you found the mattress in the twin bedroom hard. We spent a long time testing out various types of mattress and looked into what sort of mattress is better for people with back problems. The conclusion was a firmer mattress hence why we chose that type. We appreciate that the door swing in the master bedroom is tight. Old cottages unfortunately do not afford large bedrooms - no kingsize beds in the 17th Century when the house was built! We felt that guests would prefer a kingsize bed to a double bed and we moved the door to open that way as to open the other way would be more inconvenient. Thank you for your feedback and we would love to welcome you back. A perfect base to explore the Cotswolds. Miller's Cottage is just lovely - comfortable and everything we want in a cottage. The garden is great for relaxing. What a lovely review of Miller's Cottage, thank you Dionne. We're pleased to hear that you enjoyed your stay and all that the Cotswolds has to offer. We hope you visit again soon! Had a wonderful time. This cottage was perfect for us. Great location for exploring the Cotswolds. Had everything we needed. Very comfortable, nice living room and dining area and kitchen. The garden was nice to sit in, the bed was very comfortable. The parking was great and only one minutes walk away down an alleyway to a private quiet back street. Would recommend this property and hope to be back sometime soon. Thank you for your wonderful review for Miller's Cottage, Michael. We're pleased to hear that the cottage was perfect for your visit to the Cotswolds. We hope you stay again soon! Car: Winchcombe is easily accessed by car, being located approximately 10 miles away from the M5, and eight miles away from the A40, the main east-west road through the Cotswolds. Train: The nearest railway station to Winchcombe is Cheltenham (approximately eight miles away), which has regular, direct services to London Paddington, with a typical journey time of approximately two hours. Plane: Winchcombe is within easy reach of a number of international airports: Heathrow International Airport: 81 miles, approximately 100 minute drive; Birmingham International Airport: 44 miles, approximately 70 minute drive.